With the beautiful backdrop of forest, rivers and majestic wildlife, it is no wonder that New Mexico elk hunting has become one of the most popular choices for hunters of large game. Known to be one of the prime natural habitats for elk, New Mexico has taken the lead of other nearby states and used this natural resource as a way to boost the economy through big game hunts. Many hunters who dream of bagging a trophy elk against a scenic backdrop can live out their fantasy in the wilds of this spectacular state. Whether its bow hunting, muzzleloader or rifle hunts, hunters will find the challenge of hunting elk to be an appropriate and satisfying test of skill. New Mexico remains a popular and successful destination due to careful conservation methods that keep elk herd populations at plentiful levels. During the fall hunting season, one can find mature bulls bugling their way through various types of terrain. Whether opting to hunt on private or public hunting grounds, the chance for a successful hunt is very likely. Even without getting the prize, many hunters find it a perfect opportunity to study the behavior of elk up close and personal. This can only lead to better and more efficient hunts in the future. The opportunity to come in close contact with elk tends to make an impression that most hunters never forget. Each year, hunters return to their favorite public or private elk hunting grounds or to the same services that offer everything from trips on horseback to drop camps. For the seasoned hunter who knows their way around an elk hunt, the cost of bagging an elk can be extremely affordable. Those who opt for the most supreme of guide services may find the price tag a bit heavier. However, the amenities not only include showers and exceptional meal service but the cost of licenses and other needed formalities for the hunt. Whatever the choice, no one will forget a fall trip to New Mexico anytime soon. 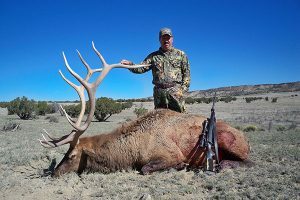 As many have found, New Mexico elk hunting can be great source of satisfaction for the big game hunter. The number of options available for hunting venues, either guided or unguided, in conjunction with a good population of elk often results in an unforgettable hunting experience. The outdoor setting and listening to the bugling of bulls as they move about the area can be every bit of a learning experience no matter how many times one has made the trip. Although large, the elk can be one of the most cunning of animals to hunt, making them the perfect challenge for many huntsmen.